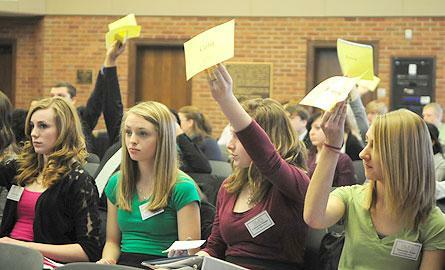 On Thursday and Friday, March 7 and 8, Hope College will host its 41st annual Model United Nations conference for high school students. More than 700 students and faculty from the greater Midwest will compete in the various simulations. Acting as delegates from the 192 member nations of the United Nations in two General Assemblies, four Security Councils, an International Court of Justice (ICJ), and an Economic and Social Council (ECOSOC), the students will be faced with issues pertaining to the current international affairs. Issues that will be discussed in this year’s conference include military spending against human needs, unity for peacekeeping, role of drug trafficking in financing terrorism, prevention of failed state, the Mali conflict, North Pole territorial claims, Syria, the need for Education, and the global economic crisis. The purpose of Model United Nations is to give high school students an opportunity to take on the roles of professional diplomats with the goal of achieving a particular country’s national objectives while fostering a desired international consensus for real solutions to the questions facing them. Hope College’s department of political science sponsors the event. Participating students, with the help of faculty advisors, have been preparing for weeks for the conference by working to identify the current issue positions of countries they have selected to represent. Throughout the event, they will discuss with their peer delegates in order to attain solutions that they feel best resolve various international problems. ECOSOC, Security Council and ICJ members begin their sessions Thursday evening and continue throughout the day Friday. General Assembly members arrive Friday morning and will debate during the day. In addition to the various sessions, students arriving Thursday will attend an opening banquet at the Haworth Inn and Conference Center that night. The Model United Nations will conclude with an awards ceremony on Friday, March 8, at 3:45 p.m. in Dimnent Memorial Chapel. The Hope College Model United Nations is organized by students in political science courses aimed at understanding international politics and the role of the United Nations in international disputes and resolutions. The Hope students serve as session chairpersons and perform other administrative tasks throughout the formation and execution of the event. The secretary generals for this year’s conference are juniors Ashley Fraley of Wellston and Kyla Koboski of Apple Valley, Minn. The director for Introductory General Assembly is junior James Teaford of San Luis Obispo, Calif. The director for Advanced General Assembly is junior Chelsea Tessier of Elkart, Ind. The directors for Security Council are senior Channa Grebe of Petoskey, and sophomores Shekinah Chandy of New Delhi, India, and Erica Simpson of Traverse City. The directors for Economic and Social Council are senior Meaghan McKeon of Tecumseh and junior Divya Dhaliwal of Northville. The director for the International Court of Justice is senior Stephen Courtade of Jenison. The faculty advisor to Model United Nations is Dr. Jack Holmes, professor of political science. Dr. Jane Dickie, a professor emerita of psychology at Hope College, is one of 18 women from West Michigan being honored as “Michigan Makers – Women Who Inspire” on Tuesday, March 12.